I’ve also already noted that oil has historically been overpriced. Middle eastern dictatorships have long relied on this for stability – Saudi Arabia most especially. Their entire nation essentially runs on a patronage system that begins at the top with the Saudi King. He buys loyalty from those directly beneath him – literally buys it – with oil money. And they buy loyalty from those beneath them with that same oil money. And so on. The entire system depends on the flow of oil money. The recent plunges in oil prices have put this system in mortal peril. The money flow has slowed tremendously. In the past, Saudi Kings would have lowered output in order to push the price back up. But right now they can’t. The obvious reason that everyone is talking about these days is all the new oil sources coming into the market, specifically from fracking in the US, but also from other sources. On top of that, OPEC has lacked the discipline it’s had in the past. If they agreed to cut output, nobody would actually stick to the agreement. But the other reason is the Saudis themselves. King Salman is caught in a huge catch-22 right now. On the one hand, if he doesn’t cut production and force prices back up it will bankrupt his country. On the other hand, if he cuts production he’ll run out of money to pay his cronies with in the short term. As I’ve noted previously, unlike his older brother King Abdullah, he has not yet had time to truly consolidate his power. He’s also eighty years old, and by all reports not in the best of mental health. And, as I noted in the piece last year, the succession path in the kingdom is currently shaky. It’s uncertain that his recently appointed heir would actually become the next king. The situation has only deteriorated since then. Oil prices haven’t risen – they’ve dropped. The price drop comes despite Saudi Arabia’s cuts to oil productionl. The Saudis’ ability to define oil prices at will hasn’t just been damaged, it’s been utterly and completely destroyed. Increases in oil production, mostly from the United States, have fundamentally changed the market dynamics. The recent output cuts from the kingdom will have only two results: reduced market share and reduced revenue. As I noted above, the Saudis cannot afford reduced revenue. They’ve already run themselves into a deep financial hole. And their country essentially runs on the royal family buying support from the peasants. When the money dries up, the powder keg explodes. I’ve also noted the political instability in the country. My very strong opinion is that whatever his actual intentions, King Salman has just laid the groundwork for a Saudi civil war. 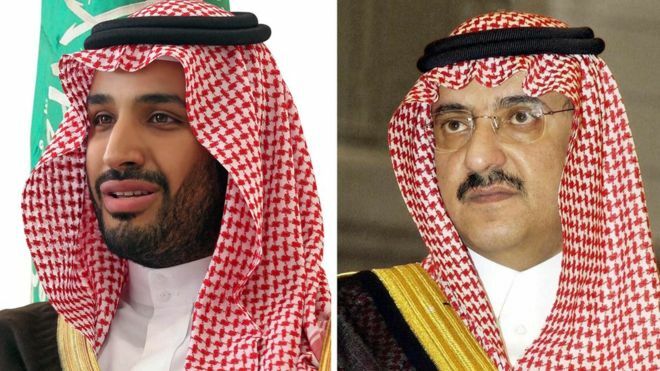 In moves announced on Saudi state television, Salman replaced Crown Prince Muqrin bin Abdulaziz and named the powerful interior minister, Prince Mohammed bin Nayef, as next in line. bin Nayef, on the other hand, is recently appointed to the position and hence will also not have had much time to consolidate his power. Again, however, he is of the Saudi royal family, so there will be some built in power base there. But he’s also unlikely to have the time to consolidate a power base. King Salman is 79. How many years before he, too passes? His predecessor, King Abdullah, lived to 90. So perhaps another decade? Maybe a few years after that? Only two years later, I could write nearly the same article today. It turns out that King Salman has, once again, replaced the crown prince. Saudi Arabia’s king has appointed his son Mohammed bin Salman as crown prince – replacing his nephew, Mohammed bin Nayef, as first in line to the throne. King Salman’s decree also means Prince Mohammed bin Salman, 31, will become deputy prime minister while continuing as defence minister. It looks like Prince Mohammed bin Nayef never had even less time to consolidate his power base than I expected. But he did manage to run down the clock, ensuring that Mohammed bin Salman has even less time than bin Nayef might have had he lasted. King Salman is now 81. How many years does he have left? His death is now even more likely to touch off a succession crisis. Given the instability already inherent in the region and the critical strategic importance of Saudi Arabia’s oil, that crisis will have global implications. Will it be the next Archduke Ferdinand moment? What Does the FBI Have on Hillary?